Combine potatoes and cream cheese with some seasonings and broth to make a delicious soup that's perfect for the cooler weather. One of my favorite soups at Panera Bread is the potato soup, and I found a recipe that is a copy-cat. It’s not perfect, but it’s still delicious! A perfect combination of potatoes and cream cheese that is great for those cool-weather nights. And the best part… this is made using just one pot and about 30 minutes. One pot means very little clean up afterward! 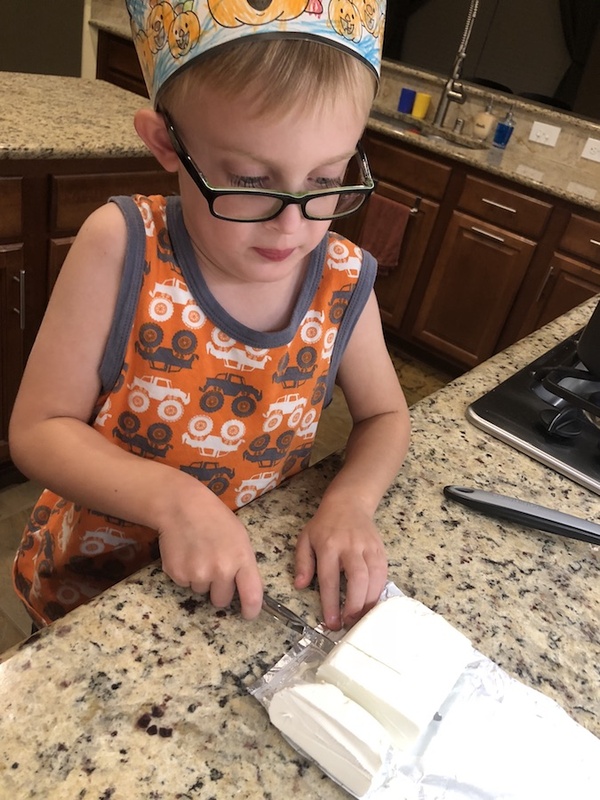 My little kitchen helper, Tyler, had a great time with this recipe and was so proud of himself because I let him use a knife for the first time (don’t worry, it was only a butter knife!). Start off by cutting your potatoes into about one-inch cubes. The first time I made this, I used a 5lb bag of potatoes on accident, and it was way too many. It came out almost as mashed potatoes. Which, while delicious, wasn’t quite the soup we were looking for. Add the potatoes and the chicken broth to a large stockpot. If you want to make this vegetarian, you could also use a vegetable broth instead. Add in all of your seasonings and bring to a boil over medium heat. Cook until the potatoes are tender, about 15-20 minutes, stirring occasionally. Reduce the heat to low once the potatoes can be easily pierced with a fork. Cut your cream cheese into chunks (so it melts quicker) and add it to the soup. Stir frequently with the pot over low heat until the cheese is melted and combined in the soup. Serve warm and garnish with a few sprigs of thyme if desired. Combine potatoes and cream cheese with some seasonings and broth to make a delicious soup that’s perfect for the cooler weather. Yes, he is always in the kitchen asking what he can do to help with our meals. What an excellent idea to add cream cheese, I can only imagine the creaminess! Also the recipe seem super easy, total perfection! I love cream cheese, any recipe for it is a winner for me! Especially one this delicious and easy to make. It’s one of my favorite soups! I’ve never thought of adding cream cheese to a soup but I imagine it’s absolutely delicious! What an easy, yummy meal- so glad to see your son having fun helping out! I will add cream cheese to anything I can! My oldest son loves to be in the kitchen, my youngest just wants to eat everything in sight!! This looks delicious! I’ve never seen cream cheese added to potato soup before but now I really have to try it! It makes it so much better! I love cream cheese. My husband loves potato soup. Your kitchen helper is a cutie. Potato soup is awesome!! And thanks, he loves to help out in the kitchen. 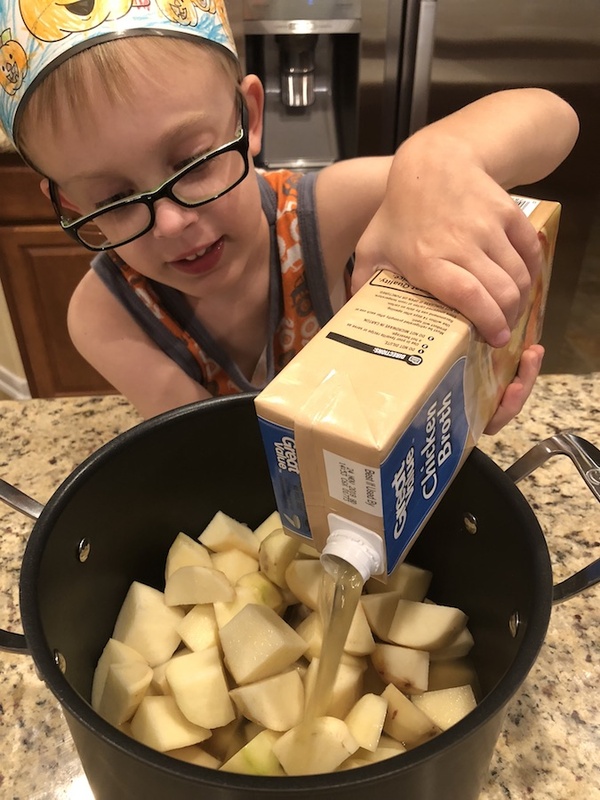 Its so good to see your son cooking with you 🙂 the recipe looks really easy to make and delicious 🙂 Thanks for sharing! He’s a great kitchen helper. He’s getting his own apron for Christmas! The soup is really easy and so yummy! It’s so good, you should give it a try! It just got cold here today, and I am so ready to make more warm dishes now! Ummm…yes! This sounds fantastic! I am all about one pot recipes. Soups this time of year are my favorite. I agree one-pot recipes are the best since I hate doing dishes!! Oh this looks so delish! Soups are really good especially on winter days. It just got cold where we live, so we will be making more soups and slow-cooker meals now for sure! I never try potato soup before but your post now makes me want to. The steps taken look easy for a newbie cook like me to follow, and the resulting dish looks amazing and tempting. I promise, it really is an easy soup to make! And it’s a perfect warm dish for the cold winter months.